Bits & Scraps Of My Life: LMLC #104 DT LIFT OFF!! LMLC #104 DT LIFT OFF!! Good morning my scrappy friends!! And as I type this it IS still morning....of course I am rather long winded but for now....IT"S MORNING!!!!!!!! That's my story and I'm stickin to it!! I was so thrilled to see some of the entries from last weeks "A Summer's End" challenge....everyone's stuff was AMAZING!!!! be sure to check the blog today because we have the winner of the My Memories digital scrapbooking software!!! And when you play around with it and learn what buttons make pretty stuff and what buttons self destruct you can join in the challenges at Digitally Sweet!!!! We are now choosing a prize winner at the end of the month....for every challenge you complete you get an entry.....so there are typically 4 weeks in a month , so that's 4 prize entries! Lookit the math brain on this girl!!!!! lol Soooo, obviously the more you play...the more chance there are for you to win. And as if that weren't cool enough, we are still picking our weekly top 3 and you get a nice shiny badge for your blog......AND we wnat you to be a part of the fun here at LM and we are looking for people who are willing to step up and be GDT!! Just add GDT beside your name when you link up....at the end of the month we will vote and it could be you!!!! The newest challenge at Lasting Memories is a DT Lift-Off! Just pick one of our DT's projects this week, they will all be linked up in all of their scrappy glory tomorrow for MoJo Monday! Pick one and simply scraplift it!!! Easy huh??? I love scraplifting and just like with the sketch challenges.....take the layout and make it your own or follow it to the letter. I bet you thought DT liftoff involved bottle rockets and nuclear warheads strapped to a DT member didn't ya? Yeahhhh I was a bit disappointed that I didn't get to fly thru the air and sing Elton Johns Rocket Mannnnnnnnnn!! I was low on my alpha stash when i created this one so the "mama's boy" part is really hard to see.....I outlined it in ink and that helped, but it's not showing well on camera. I used Bella Blvd's Mr Boy Collection on a kraft base and the black, white and grey alphas are remarks....I think?? I fussy cut a bot of the Mr Boy bits out and popdotted them, which I love to do.......only I didn't have popdots.......soooo I used leftover Thickers :) My Dt sisters are probably cracking up right about now because I keep having this recurrent dream that involved Matthew Mcconaughey and his nearly naked, tanned,Magic Mike stripper bod and thickers........seriously!!!! So I peeled these thickers off of Ol Matt's bod, with my teeth of course....sighhhhhh. And Adhered them to the back of the bits and used those for popdots. Where was I? OH!!! The Favorite Things journaling card was perfect for listing the things Jesse is loving right now......added some twine and TADA!! Done babe! You have til Saturday to link em up and show us your stuff!!! Ready.....set......go!!!! Anything But A Card Debut challenge....anything goes....so theoretically I assume you could also create a card.....Hmmmm. OH, thank you so much for my best laugh of the day! As much as I enjoyed reading about strapping DT members to flying objects and some interesting crafting time with Mr. M, I have to say that your layout still managed to grab my attention (although it did tend to drift back to Matthew a few times...)! 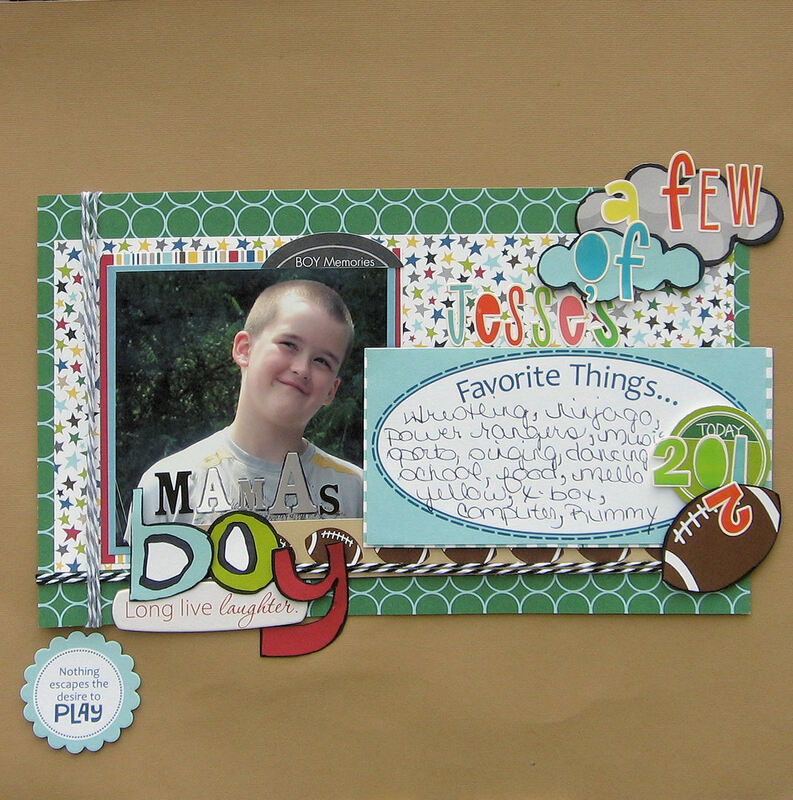 The bright colors, clean lines, and embellishments are perfect for a young man's page and the list of favorite things is such a great documenting piece! Will be fun to see how those change over the years! Thanks so much for joining us at Anything But a Card Challenge!! Really had a great time reading your post - so much fun and so informative! I must be the only person to wonder who Mr M is so I will google him later (perhaps I'm not awake enough in UK to have clocked him yet!). Love your page with the various alphabets used and the appropriate embellishments you've added. Jesse will look back at this in years to come and learn so much about little details he'll have forgotten. Thanks for joining us at ABAC. I love how you used a neutral background and layered on tons of of color cardstock to top it off!! It totally draws my eyes to the photo!! You are such a jokester. Love the way you hid the "mama" and love the idea of journaling favorite things. So many bright colors and things to look at. YAY Tina, you get an A+ for this too! Still can't believe that is a mistake! Thanks so much for joining us at Anything But a Card! oh my goodness you kill me with your posts... now i will be singing rocket man all night - great lo!! Such a fun LO! Love the mix of alphas! Thanks for joining us at ABAC!